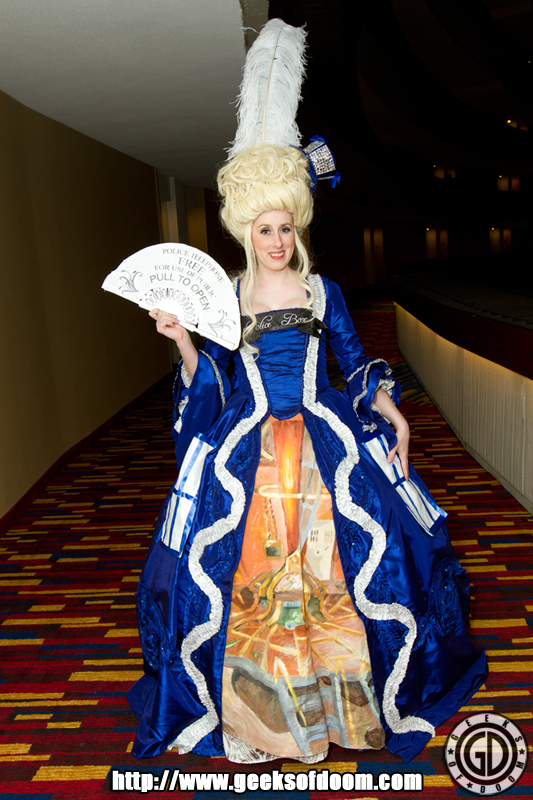 Among all the great Doctor Who cosplayers at Dragon*Con 2011 who turn props from the TV show into elegant dresses, none of them come close to the one we spotted in the photo above. Modeled after the Doctor’s police box time machine, the TARDIS ballroom dress was created by Kelldar, who is known by frequent convention goers for her awesome costuming skills. Kelldar said the inspiration for the dress came after getting an incorrect shade of blue — “TARDIS Blue” as she called it — fabric for a Marie Antoinette dress she wanted to make. Rather than ship it back, she decided to go with it. We snapped a few dozen photos, but Geeks of Doom photographer Derek Deweese only paused long enough to give me the one. We’ll have more pictures up later. So, make sure you check the site for updates.